This indispensable study tool will help readers of any age develop a personal Bible memorization plan—starting with 52 key verses of scripture. Featuring full scripture text (in the King James, New International, and New Living translations), devotional insights, and memorization tips, Bible Memory Plan is ideal for personal or ministry use. This indispensable study tool will help you develop a personal Bible memorization plan—starting with 52 key verses of scripture. Start the challenging—but life-changing—habit of memorizing God’s Word with Bible Memory Plan. This indispensable study tool will help you develop a blueprint for personal memorization, starting with 52 key verses of scripture. Featuring full scripture text (in the King James Version, New International Version, and New Living Translation), brief devotional insights, and memorization tips, this little book provides the impetus, structure, and encouragement you need to begin. You can memorize scripture—here’s how. This indispensable study tool will help you develop a personal Bible memorization plan—starting with 52 key verses of scripture. Featuring full scripture text (in the King James Version, New International Version, and New Living Translation), brief devotional insights, and memorization tips, Bible Memory Plan provides the impetus, structure, and encouragement you need to begin the challenging—but life-changing—habit of memorizing scripture. Its handy size goes anywhere, tucking easily into Bible cover, purse, briefcase, or glove compartment. Start a habit that will pay lifelong dividends! 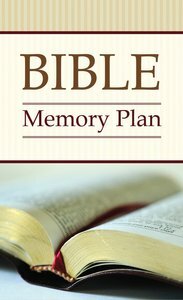 About "Bible Memory Plan (Kjv; Niv; Nlt)"
This indispensable study tool will help readers of any age develop a personal Bible memorization plan-starting with 52 key verses of scripture. Featuring full scripture text (in the King James, New International, and New Living translations), devotional insights, and memorization tips, Bible Memory Plan is ideal for personal or ministry use.